SUPERIOR, Wisc. – The Barko 270B processor is purpose-built for its application, providing several performance advantages over equipment commonly used for processing jobs. Offering exceptional horsepower, swing torque and tractive effort, the 270B features a dangle head boom configuration for picking, delimbing, cut-to-length harvesting, and stacking. Powered by a 225-horsepower Cummins Tier 4 Final diesel engine with SCR aftertreatment, the 270B offers excellent fuel economy and features large fuel and DEF tanks for longer job cycles between refills. A 36-inch-diameter auto reversing fan with automatic blade pitch control further optimizes engine efficiency. The hydraulic system on the 270B is designed to keep power constantly available, allowing operators to instantaneously shift from function to function without any of the delayed reactions common with the hydraulics on other machines. Responsive IQAN controls are customized to provide programmable settings for individual operators, along with machine diagnostics and troubleshooting. The processor features load sensing hydraulics to automatically adjust performance according to the load. High pressure and high flow contribute to delivering more hydraulic horsepower to the attachment, while a dedicated attachment pump runs the attachment without robbing power from the machine for other functions. Dual swing drives provide continuous rotation and high swing torque of 58,384 ft-lbf. Bare pin maximum lift capacity is 31,150 pounds. The 270B provides firm, stable footing thanks to long tracks measuring 15 feet, 2 inches, along with a D7 undercarriage that offers ground clearance of 29.5 inches, an overall width of 11 feet, 5.5 inches, and max travel speed of 2.9 mph. The unit delivers exceptional drawbar pull of 66,700 foot-pounds to handle hills and rough terrain with ease. Side door entry provides easy access to the comfortable cab, which offers excellent visibility of the working area. Operator ergonomics are enhanced by a heated air-ride seat, cup holder, dome light, and radio with MP3 auxiliary, AM/FM/WB, USB, XM-ready and Bluetooth. A 1.25-inch polycarbonate window and 8 exterior LED lights provide added safety. The 270B is designed to provide ample storage space, including a storage tray, two storage areas on the door, space for a lunch box inside the cab, and two additional storage areas outside the cab. Attachments can fold completely under the processor, keeping the unit compact and easy to transport on the road. A forward-sliding design allows the cab to move up to 36 inches for easier machine servicing. Additionally, a large, hydraulically-operated gull swing door offers direct access to the engine compartment and hydraulic components. The gull wing serves as a convenient working platform and includes a slip-resistant walking surface. An optional Proheat system is available to warm the engine, fuel tank and hydraulic tank in cold weather. Other performance and service options include a high pressure hydraulic filter for attachments, automatic fire suppression system, hydraulic tank vacuum pump, electric fill pump, boom lights, and various track shoe sizes and styles. Cab options include a rear-view camera with 7-inch display, CB radio, window reinforcement bars, oversized skylight, window shades and cab lights. Barko Hydraulics, LLC is part of the Pettibone, LLC Heavy Equipment Group. 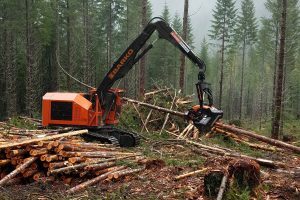 Founded in 1963, Barko has consistently led the industry with innovative solutions to the forestry, scrap and construction markets, including industrial tractors, crawlers, handlers, loaders, forwarders, chippers and harvesters. For more information, call 715-395-6700 or visit www.barko.com.